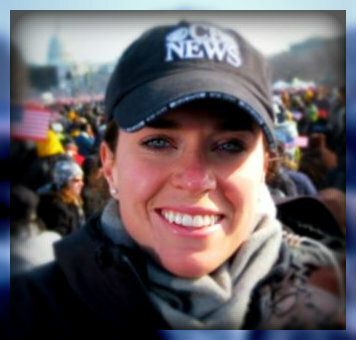 Paige Kendig was hired 4 days after she applied to the CBS News page program. That’s a company record. And it had nothing to do with the fact that Paige was a page. The 2000 Staples High School grad has been with CBS News ever since. She started as “The Early Show” weatherman (and Weston resident) David Price‘s assistant. Her tasks ranged from getting his coffee and walking his dog, to traveling around the world with him and learning to be a producer. Paige was always a quick study. Paige Kendig, at the 2008 presidential inauguration. At Colgate she double majored in peace and conflict studies, and anthropology. Her thesis was on Rwandan genocide. During Katrina, Paige sat in a small room for hours, watching feeds. She wanted to be ready for the next hurricane. Four years ago, she was promoted to producer. Working with “Early Show” anchor Harry Smith, Paige started with light stories. But she moved on to the Gulf oil spill, presidential debates and the Haiti earthquake. Every day is different. There are stories to plan, camera crews to assign, interviews to arrange and conduct, footage to log, scripts to write. 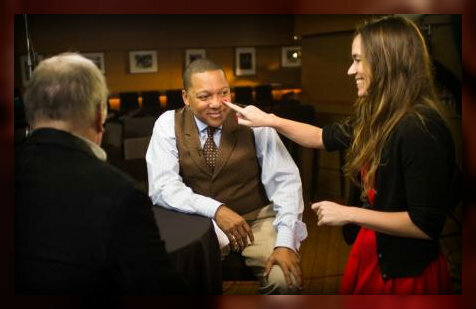 Paige Kendig is “CBS This Morning” cultural correspondent Wynton Marsalis’ producer. She touches up his makeup, as Paul Simon — yes, that Paul Simon — looks on. Last January, the “Early Show” morphed into “CBS This Morning.” It was envisioned as more news-oriented than other morning offerings. Paige now works with co-anchor Charlie Rose. And “work” is the right word. One Saturday, the staff decided to interview King Abdullah II of Jordan. 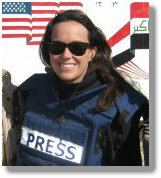 By Thursday, Paige was on a plane to the Mideast. She’d had just 4 days to devise a 100-page document envisioning the entire trip. Who else would be interviewed? Where? She also helped create 80 or so questions for the king. How does Paige know what to do? Brad Pitt’s interview was exciting. 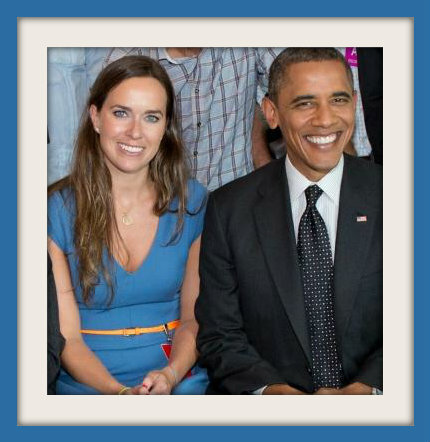 But nothing compares to her “dream story”: a sit-down with President Obama in the White House. Being a morning show producer means insane, unpredictable hours — and lots of them. Being young, she’s still got plenty of goals. Being a “60 Minutes” producer would be great. Right now, though, Paige is loving “CBS This Morning,” and taking each show one day at a time. One action-packed, unpredictable, newsworthy day at a time. This entry was posted in Entertainment, People, Staples HS and tagged CBS News, CBS This Morning, David Price, Paige Kendig. Bookmark the permalink. I guess this goes to show both the value of landing a good internship and then making the most of an opportunity once you have it. Kudos to Paige. There were no internships when my sister Suzy ’65 began her career at CBS in 1969. Women, no matter their success in college, all started as secretaries. Fast forward 43 years and Suzy is still at CBS having moved from secretary to associate news producer at WCBS TV to producer to many years at CBS Evening News as as senior producer under Walter Cronkite and Dan Rather and now as senior coordinating producer/48 Hours. I look forward seeing Paige continue to chart her own course there as well.